Sound and vibrational healing would have to be up there as one of my favourite modalities. You can literally feel the disturbances in your energy being cleared there and then, You can walk into a session feeling anxious and unsure then walk out again feeling lighter, clearer and so much more confident about yourself and life. Sound healing works towards balancing your physical and energetic bodies much in the same way as Reiki and crystal healings as well as vibrational remedies and other alternative medicine. Sound and vibrational healing dates back to ancient times originating from varied societies and cultures all around the world. Although sound and vibrational healing is not necessarily considered mainstream within the medical profession it is still common practice within religious and tribal ceremonies in most countries whether it be through sacred sound, chanting, prayer or song. Whether it be science, spiritual or tribal belief the one thing that they all have in common is that of the knowledge that the universe and all that we feel is a constant state of vibration made up of different frequencies. Meaning that everything in nature and yes that includes us too, vibrate to sound, light and colour. Keeping it simple if you think about how music or song can transform a down, dull mood into that of joy, calm and or happiness it’s much the same as vibrational and sound therapy, the sound can be piercing and very confronting as it’s clashing with your energetic layers then it can be incredibly soothing and calming, either way the sound is both balancing and clearing your energetic and physical bodies of any vibration that isn’t working in harmony with your complete being. It is believed that every cell, organ, gland and chakra within our being vibrates at its own unique frequency matching similar musical notes. 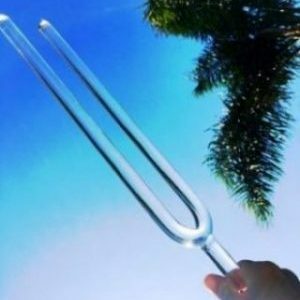 As such Tuning forks are a wonderful vibrational healing therapy which I regularly use in my clinic to correct any misalignment either within your physical, emotional or energetic bodies. As it works on balancing the nervous system the vibration and sound allows you to slip into a deep relaxed state, dissolving stress allowing mental and emotional clarity. Alleviating stress increases your energy and allows you to get back to doing what you love.